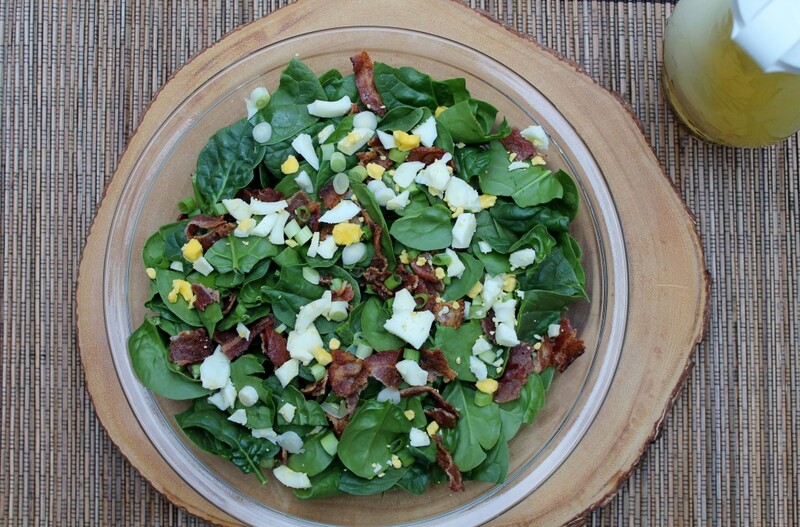 A traditional spinach salad with bacon, hard-cooked eggs, and onions. Such a classic and ever so satisfying. My mom got this recipe from one of her friends years ago and she has been making it ever since. It is requested at many family functions and a true crowd pleaser. This salad is packed with flavor and makes a wonderful main course salad for lunch or a light dinner, or served as a side dish. 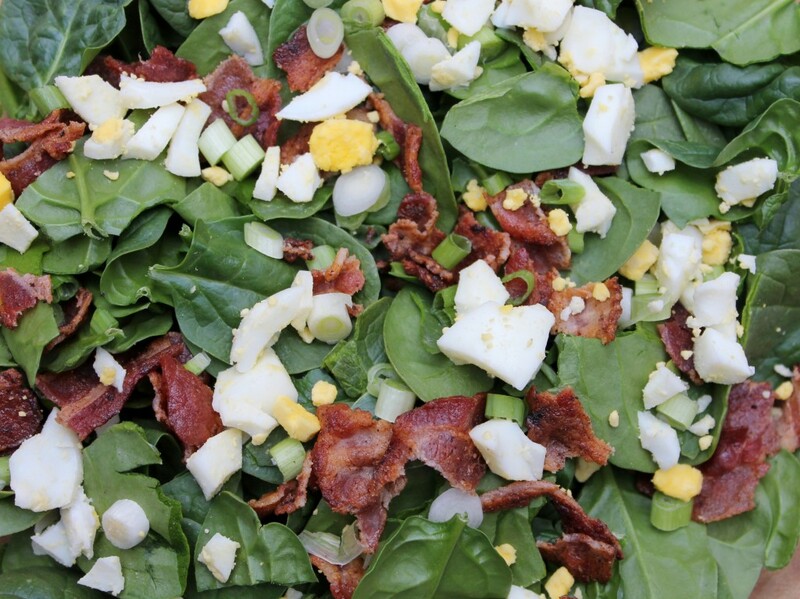 Each bite has smooth leaves of spinach contrasting with crunchy bacon, while the eggs are soft and chewy. The dressing is simple, not the typical spinach dressing made from bacon fat, yet an absolute must on top of this salad. The recipe for the dressing makes double of what you will need but leftovers will keep in the fridge for up to 1 month. This recipe Serves 8-10 people but take into consideration what you are serving it with and whether or not it is the main course or a side dish. Oh and make enough for people to go back for seconds because guaranteed they will. 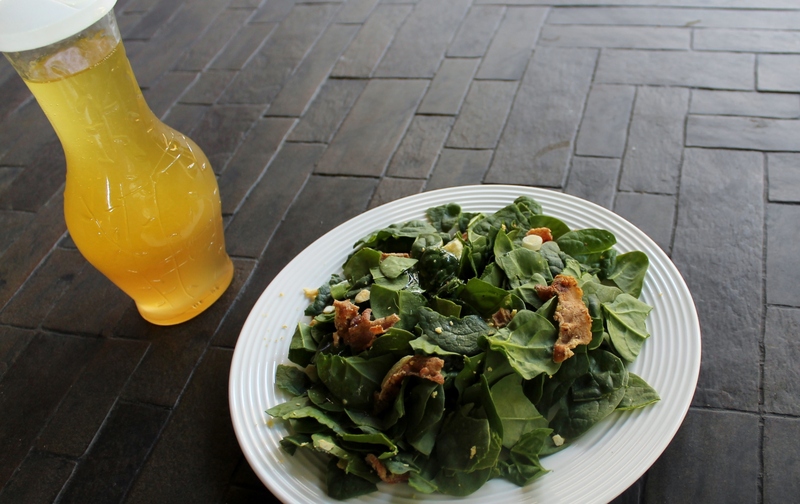 Nutrition information includes 1 salad serving with 2 tablespoons of dressing. In a small frying pan over medium heat, fry bacon approximately 5 minutes or until crisp; transfer to paper towel-lined plate. Allow to cool then chop into small pieces. Remove the shell from the hard boiled eggs and chop into small pieces. Mix together the sugar, salt and dry mustard. In a separate bowl mix the olive oil, vinegar, and onion juice. Slowly pour the wet ingredients in with the dry, mixing as you pour. Store the dressing in sealed container and keep in the refrigerator for up to 1 month.